“Szczecin-Poznan Train Trip Sound-drawing” and an animated film “The Train Trip” duration: 7 min 30 sec; music original score: Gosia Wlodarczak; the score digital realisation: Alistair Noble; film production, editing, animation: Gosia Wlodarczak; photography: Longin Sarnecki. This project belongs to my ongoing search for possibilities, methods, and strategies to convert visual perceptions into aural. In my sound installations (sound-drawings) I am aiming for an aural equivalent of the visual sensual experience. I carry the utopian idea to hear what I am looking at. Since 2006 I have been developing processes and codes to make the conversion of visual into aural impressions possible. To decode a visual image into a musical score I use elements of musical notation as simply another set of drawing marks rendering a likeness of what I see. I do not draw/write notes with specific sounds in mind. I am not a musician but a visual artist, and I do not hear notes. Configurations of different notes positioned on multiple musical staves (using a code I developed), form original music scores, describing and translating in a most visually objective way possible, an appearance of an object, or a view. Then I collaborate with a composer Alistair Noble who translates my music scores into digital sound. 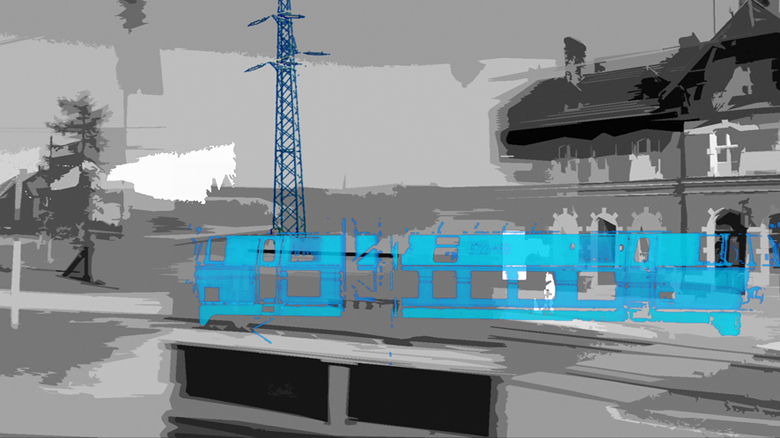 “Szczecin-Poznan Train Trip Sound-drawing” is an aural translation of a view along a railroad track I looked at through the train window while traveling from Szczecin to Poznan (in Poland) in spring 2007. This trip takes three hours and connects two places where I used to live. Szczecin is my hometown where my mother, and grandmother still live. Poznan is a city where I studied and lived as an adult until immigrating to Australia. The journey between these two cities is imprinted in my memory. Gosia Wlodarczak was born in Poland (1959) and graduated Master of Fine Arts with Distinction from Poznan Academy of Fine Arts, Poland (1984). She arrived in Australia 1996, works and lives in Melbourne. Since in Australia she was awarded numerous prizes and grants including: 2008 Australia Council Skills and Development Grant, 2007 Edith Cowan University Public Art Project, Western Australia; 2006 Australia Council Grant for Established Artists; 2005 Hutchins Prize in Tasmania; 2005 Whyalla Art Prize in South Australia; 2004Ministry for Culture & the Arts Western Australia,New Project Grant. She has held 47 solo exhibitions and performances including: Frost Drawing for the Library, LUMA La Trobe University, Melbourne (2011), Shared Space New York, Kentler International Drawing Space, Brooklyn, USA (2008), Cinderella II – The Dreamer, SASA Gallery University of South Australia (2008), Space Active at Perth Institute of Contemporary Art (2005). A five times finalist for The Dobell Drawing Prize at the Art Gallery of New South Wales (2003 - 2010), she exhibited in: Freehend: recent Australian drawing at Heide Museum of Modern Art (2010), I walk the line at the Museum of Contemporary Art, Sydney (2009), and the 5th Drawing Biennale at the Drill Hall Gallery, Australian National University (2004). In 2011 Wlodarczak shows her work in the Drawing Center of New York exhibition in conjunction with The Big Screen Project, and participated in Singapore Biennale: Open House. In 2010 held three-month the Australia Council Greene Street Studio residency in New York, USA. In 2012 she is invited to hold three-month solo exhibition with residency at the Western Gallery, Western Washington University, Bellingham, USA. Her work is represented in collections including: National Gallery of Australia; Art Gallery of South Australia; Jewish Museum of Australia; Artbank; Edith Cowan University; Murdoch University; Poznan Academy of Fine Arts, Western Washington University.